Located just off the A15, a 10 minute drive from the University of Lincoln, Brayford Campus sits the Riseholme Park Campus. Home to our agricultural, equine and animal behaviour courses. 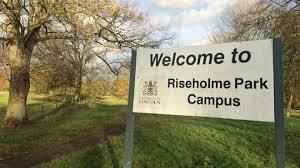 The Riseholme Park campus boasts three separate halls of residence, a student bar and extensive equine, agricultural, horticultural and animal learning facilities. The picturesque Old Hall, positioned in front of the lake and completed in 1744 could be described as the landmark of the 200 hectare grounds of both broadleaf woodland and agricultural land. For any information or to enquire about a booking, please ring 01522 886688.